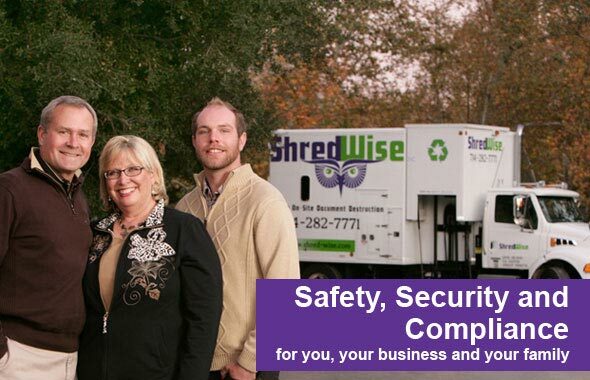 Shred Wise Inc. is Anaheim’s local source for secure, reliable, and affordable shredding services. We have served thousands of residential and commercial clients in Anaheim and beyond since 2006 and built a reputation for providing the best value in document destruction. With our state-of-the-art shred truck, we are able to offer cost-effective paper shredding both on site and off. Our shredding services can be scheduled just when they are needed or on an ongoing, regularly scheduled basis. In either case, our shredding service will be designed to help you with your specific needs, whether that’s complying with federal privacy laws or ensuring that you, your business, or your clients don’t fall victim to identity theft. 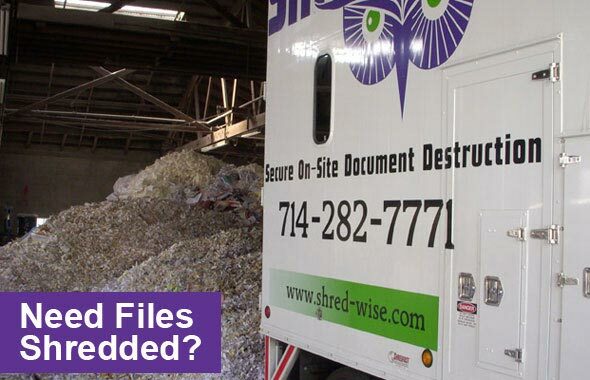 While document destruction may seem overwhelming, Shred Wise is here to make it easy, convenient, and affordable. We offer flexible document destruction programs in Anaheim with no long-term contract requirements, and always deliver service with a smile. Call today and we’ll provide you with an estimate over the phone, answer your questions, and/or schedule an on-site consultation. On-site shredding (aka mobile shredding) is the service most frequently requested by our customers in Anaheim. This shredding service involves us driving our shred truck out to a client’s address, picking up their documents, loading them curbside into the truck, and shredding them on site. Clients can observe the destruction process while curbside or while watching our onboard video camera. Once we are done, we’ll provide you with a Certificate of Destruction, and we transport all shredded paper to a secure recycling facility nearby. With every on-site/mobile shredding service we perform in Anaheim, we guarantee that your documents will be 100% destroyed and 100% recycled. Our on-site shredding service is not only convenient and compliant with privacy laws, but also highly affordable. Call today for a free quote. Our off-site shredding services are a great option for Anaheim businesses that have their paper stored in an area that is difficult for our shredding trucks to access. We will pick up your paper to be shredded in our locked trucks and transport it to our facility in Orange, CA where we it will be quickly and securely shredded by our carefully vetted personnel. Your paper is destroyed on the same day and we issue a Certificate of Destruction for your records. If you wish you can also send out a representative to witness the destruction of your documents. Call today to learn more or to schedule off-site shredding services in Anaheim. Shred Wise Inc. is qualified to work with the diverse range of industries represented throughout Anaheim, including health care, legal, retail, financial, defense, education, food and beverage, transportation, and more. Since all of these industries work with confidential information–such as employee records, tax records, bank statements, payroll records, medical records, client information, etc.–it is important that they take the necessary steps to keep such information secure until it is ready to be destroyed. This not only protects businesses from unnecessary risk and liability, but also protects their shareholders, clients, and employees who entrust them with such sensitive information and keeps them in compliance with FACTA and other privacy laws. 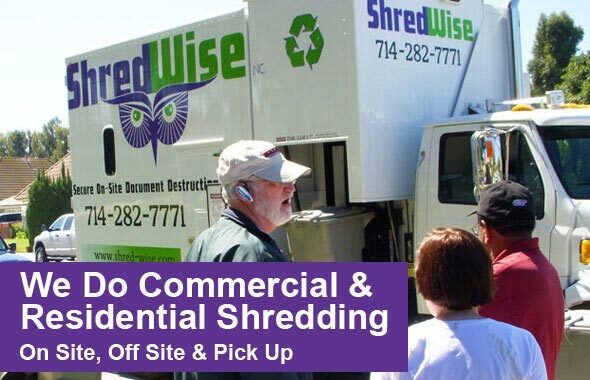 By working with Shred Wise Inc., your Anaheim business will be visited as often as needed to ensure that your private documents are properly destroyed. We follow the best practices outlined by NAID, and stay up to date with the industry’s leading procedures and equipment. Call today to learn more about our commercial shredding services in Anaheim. Since we started our business in 2006, we have heard Anaheim resident tell us time and time again that they thought mobile shredding services were only for businesses. We’ve also heard customers tell us they believed mobile shredding would be cost prohibitive for a one-time shredding request. However, having been victims of identity theft ourselves, we at Shred Wise know that shredding services are extremely important for both individuals and businesses. Both deal with confidential information that, if stolen, can be used to cause great harm. In fact, did you know that any documents with just two pieces of personal information, such as a name and address or a name and ID number, should be shredded? To help our residential clients in Anaheim, we do our best to make our shredding services not only accessible but also affordable. With as few as seven or eight boxes of paper, our mobile shredding services become less expensive than taking them to an onsite shredding company. Plus, with that much paper to shred, you’ll save yourself the time and hassle of doing it yourself and gain the peace of mind in knowing that your documents have been completely destroyed, diluted with hundreds of pounds of paper from other clients, and then recycled. To learn more about our residential shredding services in Anaheim, call today. Shred Wise Inc. is a licensed, bonded, and insured paper shredding company. We are committed to following NAID’s Code of Ethics and best practices for document destruction. Call us between 7am and 5:30pm, Monday through Saturday, or 8am and 12pm on Sundays for a free estimate over the phone or an on-site consultation in Anaheim. We look forward to hearing from you.